Afghans have lost trust in the credibility of the process. They would rather have a bad government than no government at all, because the risk of uncertainty takes a huge toll. As President Obama develops a new Afghanistan strategy, rising violence there and an unresolved election have combined to sap public support for the war. Ashraf Ghani, who was one of Afghanistan's presidential candidates, discusses his country's future. JIM LEHRER: Finally tonight, our newsmaker interview with former Afghan official and presidential candidate Ashraf Ghani. Margaret Warner is in charge. MARGARET WARNER: For the fifth time in recent weeks, President Obama called in his national security team at the White House today to continue their reassessment of Afghan war strategy. Earlier today, U.K. Prime Minister Gordon Brown went to the House of Commons to announce that despite mounting British deaths in Afghanistan, he was sending an additional 350 troops there. GORDON BROWN, prime minister, Britain: The combination of force levels, equipment levels, and tasks that I'm setting out today follows the clear military advice from our chiefs of staff and from our commanders on the ground on implementing our strategy and reducing the risk to our forces. And it's on this basis that I have agreed in principle to a new British force level of 9,500, which will be put into effect once these conditions are met. MARGARET WARNER: The U.S. ground commander in Afghanistan, General Stanley McChrystal, has recommended President Obama send many more American troops, up to tens of thousands more, according to reports. But, yesterday, the president indicated his decision is still some time off. U.S. PRESIDENT BARACK OBAMA: We are going through a very deliberate process that is completely consistent with what I said back in March. After the election, I said it was important for us to reassess the situation on the ground. And that's what we're doing, not just on the military side, but also on the civilian side. I would expect that we will have a completion of this current process in the coming weeks. MARGARET WARNER: One of the factors going into his decision, but still unknown, is who will be president of Afghanistan in the next five years. Last month, Afghan election officials declared President Hamid Karzai had won 54.6 percent of the vote in the August presidential contest, enough for reelection. But the entire process was marred by widespread allegations of fraud. More than 3,000 polling stations were deemed to have reported questionable results, for example, all ballots cast for the same single candidate. Ten percent of those questionable ballot boxes are now being audited. The results are expected by the end of this week. 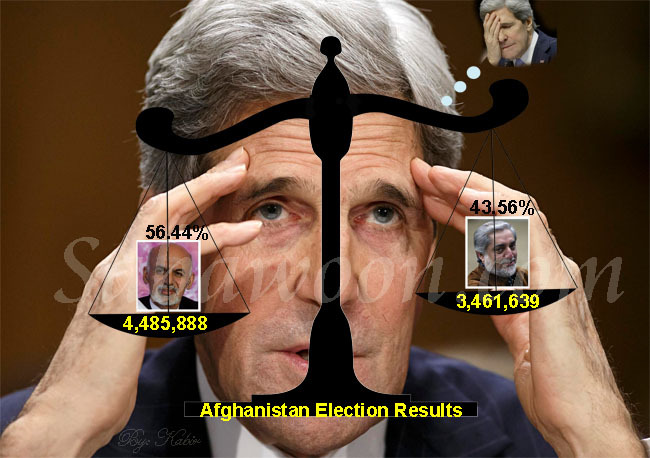 If they show Karzai fell below 50 percent, he would face a runoff against second-place finisher Abdullah Abdullah. Another Karzai opponent in the race was former World Bank official and Afghan Finance Minister Ashraf Ghani. He ran on a platform of good governance. Ghani served in Karzai's original cabinet, but quit five years ago, alleging corruption and mismanagement. Though his campaign was managed by former Clinton political guru James Carville, Ghani came in a distant fourth. MARGARET WARNER: Ashraf Ghani is in Washington this week for a series of meetings. And he joins us now for his assessment of where Afghanistan goes from here. Mr. Ghani, thank you for returning to this table. ASHRAF GHANI, former Afghanistan presidential candidate: Pleasure to be with you. MARGARET WARNER: As we just said, all of Washington is awaiting this election recount result -- could come tomorrow, could come Friday. What confidence should we have, what confidence do you have that the result will be seen as credible, whatever it is? ASHRAF GHANI: Unfortunately, it's a situation where no institution associated with the election now is viewed as neutral by the two main parties. So, regardless of the decision that is taken, one side or the other is likely to question it, unless there have been serious discussions in the last 24 hours between Mr. Karzai and Mr. Abdullah to arrive at some sort of consensus. If that takes place, then the results could be acceptable. Otherwise, the adherents to one party or the other are likely to question it. MARGARET WARNER: So, do you think it's a good idea for Karzai and Abdullah to come to some agreement? ASHRAF GHANI: What is important is that the people are haunted by risk of violence. People are really concerned about the specter of '91-'96, when every street was controlled by a different group. MARGARET WARNER: Which set the stage for the Taliban takeover. ASHRAF GHANI: Which set the stage for the Taliban takeover. So, Afghans have lost trust in the credibility of the process. They would rather have a bad government than no government at all, because the risk of uncertainty takes a huge toll. And it has allowed criminal elements to fill a vacuum that the security forces and institutions of state do not attend to. MARGARET WARNER: But, now, the constitution requires that if the two top finishers, neither gets 50 percent, they go to a runoff. MARGARET WARNER: Could that solve this? MARGARET WARNER: Running the election, running this election commission. ASHRAF GHANI: Running the election -- becomes problematic, because, in the first round, the results were not problematic because they were fair. It is precisely because the machinery of the state, the government, was used in favor of one or the other candidate, and a lot of votes of other people were stolen. You need to construct the framework that responds to the needs and aspirations of the Afghan people, that are simultaneously the requirements of our international partners. MARGARET WARNER: All right, let me get to the deeper issue which the election has just become a metaphor for, and it's the thing you campaigned on. And that is the perception here of widespread corruption and mismanagement at every level of the Afghan government. You ran on a platform of good governance. Give me three concrete things that actually could be done to end this cycle of self-dealing, which is what you have got going on there now. ASHRAF GHANI: Yes. It would be very simple at one level..
First, all officials, the 3,000 top officials, who are appointed to the government should declare their assets. The assets should be verified by an independent civil society commission. And, every year, the assessment has to be renewed. Two, all contracts for minerals -- Afghanistan is actually quite rich in mineral resources -- need to be brought under scrutiny, so that people know what's happening. And, three, the key sources of revenue -- customs, for instance -- has to be managed through a public reporting card, where merchants and others actually see that the laws are applied and that those who bribe and take bribes, some of whom make $100,000 a day are brought under control. MARGARET WARNER: But, now, when you were in government, you advocated measures like these, and you finally quit in disgust, saying President Karzai just wouldn't take any of this on. So, under what circumstances could he now be brought, if he is to continue as president, be brought to recognizing and having the political will to do it? ASHRAF GHANI: What is required is not to look at the person, but look at the framework. ASHRAF GHANI: After he was elected. MARGARET WARNER: ... and there was no longer any under U.N. oversight. ASHRAF GHANI: So, we need now, given the domestic concern about corruption and also the international concern about corruption, and particularly the concern from the military -- General McChrystal has really put his finger on the issue of good governance as the solution. Then, you need to construct the framework that responds to the needs and aspirations of the Afghan people, that are simultaneously the requirements of our international partners. MARGARET WARNER: So, is the U.S. -- as President Obama is considering this decision, I mean, is the U.S. in any position to insist on that kind of framework, to insist on those sorts of conditions? ASHRAF GHANI: Yes, absolutely, because the U.S. is one of the largest providers of assistance? And it is American lives that suffer or are lost due to corruption. ASHRAF GHANI: Yes, and he uses the term -- is part of the problem, that ISAF needs to be as much concerned about political brokers and government officials who abuse their authority, and that there's a clear difference between political will and outright criminal behavior. Unless Afghans agree to a series of sacrifices in order to secure our national interest, such a framework cannot be put together. MARGARET WARNER: Now, one of the possible vehicles that's been discussed as a way of the U.S. and the international community influencing a future Karzai presidency would be to have you be tapped to come back in, in a senior executive position, with actually to really clean house. Have you been approached about this? Have you discussed it? Would you be willing to do it? ASHRAF GHANI: The issue has been discussed. It's not new. The issue has been discussed over the last two years repeatedly. And it did not reach conclusion, because the outcomes that are required for good governance and the authorities that are required for that could not be agreed upon. What I have said is that I'm not interested in power. I am interested in results and would be willing to help put the framework that could give us a map of the future, particularly for the next 12 months, that are both critical for winning the confidence of the Afghan people and the confidence of our international partners, both Europe and the United States. The public is now very concerned, and support is dropping. So, if -- unless Afghans agree to a series of sacrifices in order to secure our national interest, such a framework cannot be put together. MARGARET WARNER: But you're saying the international community has to insist on it, and then President Karzai has to be willing to accept it? MARGARET WARNER: Ashraf Ghani, thank you so much. ASHRAF GHANI: Pleasure to be with you.